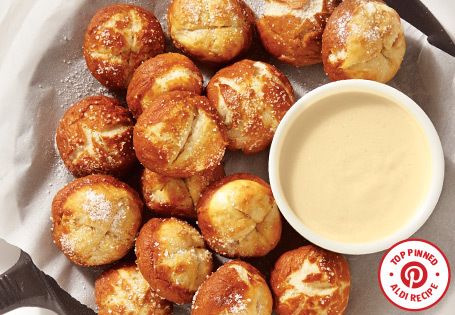 Freshly baked bite sized pretzels served with a rich, creamy cheese sauce. For the pretzel dough: In a large bowl, combine warm water, sugar and yeast. Mix until yeast is dissolved. Add flour, butter and ¾ teaspoon of salt. Mix until a soft dough forms. Knead for 10 minutes. Use additional flour if dough becomes too sticky. Place in a bowl coated with cooking spray and cover with plastic wrap. Allow to rest in a warm place until doubled in size, about 30 minutes. In a medium pan, bring 6 cups water and baking soda to a boil. Preheat oven to 375°. Punch down the excess air from the dough. Break off 1-inch pieces and roll into balls. Dust with flour if dough becomes too sticky. Place on a parchment lined sheet tray coated with cooking spray. Cover with a damp cloth and rest in a warm place for 5 minutes. Drop each dough ball into boiling water, no more than 5 at a time. Cook for 30 seconds. With a slotted spoon, remove dough and return to parchment lined sheet tray spaced ½-inch apart. Sprinkle with a pinch of salt and cut an X into the top of each roll. Bake for 10-15 minutes. Remove from oven and rest for 5 minutes before removing from tray. For the Beer Cheese Sauce: In a medium saucepan, over medium heat combine cream, onion, salt and pepper. Bring to a simmer; add cheese and whisk until melted. In a separate small bowl, mix together corn starch and water until dissolved. Add corn starch mixture and beer to cheese sauce. Continue whisking over medium heat until sauce thickens. Remove from heat, strain and serve immediately with warm rolls. TIP: To make the cheese easier to shred, place in freezer for 30 minutes.